The Faculty of Sport and Exercise Medicine UK has produced this guide on the role physical activity has in treating mental illness for health professionals, sports participants, schools, parents and carers. 1. The UK government has defined wellbeing as ‘a positive physical and social and mental state’ (Department of Health, 2010). Mental wellbeing includes factors such as individuals’ ability to develop their potential, work productively and creatively, build strong and positive relationships with others and contribute to their community’ (8). It also involves areas of life such as feelings of satisfaction, optimism and self-esteem. One way to enhance our mental wellbeing and protect our mental health is through participating in physical activity. Physical activity has been shown to have a strong and positive influence on mental wellbeing and some mental illnesses(9). Participation in regular physical activity can increase self-esteem and reduce stress and anxiety. Physical activity can help play a role in preventing mental health problems and improve the quality of life of those experiencing them(9). 2. Physical activity can be used in treatment for depression and be used as a standalone treatment or as a combination therapy with medication and/or psychological therapy (10). Strong evidence exists showing a 20-30% reduction in depression in adults who participate in physical activity daily (11). Exercise has potential advantages over antidepressants with fewer side effects, and perhaps less stigma attached to it as treatment modality in comparison to counselling or psychotherapy. Limited evidence exists proving physical activity can reduce levels of anxiety and distress in people with mild symptoms by 20-30% (11)and may also be helpful for treating clinical anxiety. Physical activity is available to all, has few costs attached, and is an empowering approach that can support self-management. 3. There is clear evidence that physical activity reduces the risk of cognitive decline in adults and older adults with a 20–30% risk reduction in developing dementia for adults participating in daily physical activity(11). Physical activity also seems to reduce the likelihood of experiencing cognitive decline in people who do not have dementia(11). 4. Physical activity can increase self-esteem and reduce depression and anxiety in children (12). We also know that physical activity performed in an outdoor space can improve cognitive performance, self-esteem and reduce anxiety and symptoms related to attention deficit disorder (13). There needs to be clear pathways safeguarding vulnerable adults and children suffering from mental health issues when participating in physical activity and safeguarding generally for all those participating in organised sport. Organisations that promote physical activity in patients with mental health problems should have designated safeguarding staff and referral pathways to more specialist services. This includes the management of acute mental health conditions. 5. The Faculty recognises the prevalence of mental health conditions in minority groups, such as ethnic minority and LGBT groups, and how this correlates with lower levels of physical activity(11) and morbidity. Special provisions and methods need to be available to target vulnerable patients and minority groups with mental illness to improve outcomes by removing barriers to these groups (14). Sports participation represents a strategy to reach these groups and perhaps help breakdown stigma. 6. Fulfilling Public Health England’s action of ‘Moving professionals’; the Faculty encourages clinicians to promote the use of physical activity as an important intervention in the management and prevention of mental health problems across all age groups. This is important to remember in groups at risk for low levels of physical activity such as minority groups and older adults (11). 7. There is increasing cooperation between Community Mental Health teams and recreational sport, with recognition that club and team environments can provide supportive and welcoming communities for those with mental health issues. 8. Green space is now widely viewed as a health-promoting characteristic of residential environments, and has been linked to mental health benefits such as recovery from mental fatigue and reduced stress. Furthermore, there is evidence to suggest that the effect of exposure to natural environment can significantly reduce health inequalities (15). The Faculty promote existing government and community schemes to increase activity in green spaces. 9. The Faculty recognises that mental health charities such as Mind and the third sector can help bridge the gap where NHS services fail or are unable to support patients with exercise and advice. 10. The Faculty promote the recommendations made by ‘The Duty of Care Review’, including mental health training for coaches and support staff. NGBs should aim to strengthen links with NHS mental health teams, charity and support groups. This further promoted through the Faculty’s support of the Department for Digital, Culture, Media and Sport’s policy paper, ‘Mental Health and Elite Sport Action Plan’. 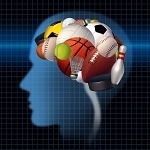 The policy outlines the plan for improved mental health support to elite and professional sports people (16). 11. The Faculty encourages organizations to sign up to the ‘Mental Health Charter for Sport and Recreation’(7) to help embed mental health within their own institutions and more widely in the sport and recreation sector. 12. It is also important to consider mental health problems that may be more common in those who play sport professionally, not recreationally. Here, sport can bring pressure rather than benefit to the participant’s mental health. Athletes may be more susceptible to particular presentations: eating disorders (17); alcohol use (18); and suicide (19). Certain subgroups among professional sport show increased prevalence of mental ill health: retired elite athletes(20, 21); those experiencing performance failure (22); those who have suffered injury and other major negative life events (which happen to athletes more often as young adults)(23, 24). 13. Athletes tend not to seek support for mental health problems. This is found to be because of: stigma; lack of understanding about mental health and its influence on performance; perception of help seeking as a sign of weakness(25). This can bring increased risks and requires a different approach that understands the cultural differences unique to elite sport. There is compelling evidence for the therapeutic use of physical activity and Exercise Medicine in the prevention and treatment of disease and many common conditions including mental health. This statement can be used alongside our other evidence based resources, including Moving Medicine which will contain an educational resource for depression and exercise when launched in September 2018(26). ©Faculty of Sport and Exercise Medicine UK – The Role of Physical Activity and Sport in Mental Health May 2018 to be reviewed May 2021. England S. Towards an active Nation 2016 [Available from: https://www.sportengland.org/media/10629/sport-england-towards-an-active-nation.pdf. Government H. Sporting Future: A New Strategy for an Active Nation. 2015. Vancampfort D, Stubbs B, Firth J, Hallgren M, Schuch F, Lahti J, et al. Physical activity correlates among 24,230 people with depression across 46 low- and middle-income countries. J Affect Disord. 2017;221:81-8. Harvey SB, Øverland S, Hatch SL, Wessely S, Mykletun A, Hotopf M. Exercise and the Prevention of Depression: Results of the HUNT Cohort Study. Am J Psychiatry. 2018;175(1):28-36. Psychiatrists RCo. Physical Activity and Mental Health [Available from: http://www.rcpsych.ac.uk/healthadvice/treatmentswellbeing/physicalactivity.aspx. McManus SB, P Jenkins, R Brugha, T. Mental Health and wellbeing in England: Adult psychiatric morbidity survey 2014 . Leeds: NHS digital2016 [Available from: http://digital.nhs.uk/catalogue/PUB21748. Mind, Federation PP, alliance Sar. Mental health charter for sport and recreation 2017 [Available from: https://www.sportandrecreation.org.uk/policy/the-mental-health-charter. Beddington J, Cooper CL, Field J, Goswami U, Huppert FA, Jenkins R, et al. The mental wealth of nations. Nature. 2008;455(7216):1057-60. Rosenbaum S, Tiedemann A, Sherrington C, Curtis J, Ward PB. Physical activity interventions for people with mental illness: a systematic review and meta-analysis. J Clin Psychiatry. 2014;75(9):964-74. Rimer J, Dwan K, Lawlor DA, Greig CA, McMurdo M, Morley W, et al. Exercise for depression. Cochrane Database Syst Rev. 2012(7):CD004366. Health Do. Start active, Stay active. 2011. Biddle SJ, Asare M. Physical activity and mental health in children and adolescents: a review of reviews. Br J Sports Med. 2011;45(11):886-95. WOOLEY H, PATTACINI L, SOMERSET-WARD A. Children and the natural environment: experiences, influences and interventions – Summary. Natural England Commissioned Reports, Number 026.2009. Firth J, Rosenbaum S, Stubbs B, Gorczynski P, Yung AR, Vancampfort D. Motivating factors and barriers towards exercise in severe mental illness: a systematic review and meta-analysis. Psychol Med. 2016;46(14):2869-81. Mitchell R, Popham F. Effect of exposure to natural environment on health inequalities: an observational population study. Lancet. 2008;372(9650):1655-60. Department for Digital C, Media and Sport. Mental Health and Elite Sport Action Plan. 2018. Sønderlund AL, O’Brien K, Kremer P, Rowland B, De Groot F, Staiger P, et al. The association between sports participation, alcohol use and aggression and violence: a systematic review. J Sci Med Sport. 2014;17(1):2-7. Baum AL. Suicide in athletes: a review and commentary. Clin Sports Med. 2005;24(4):853-69, ix. Gouttebarge V, Frings-Dresen MH, Sluiter JK. Mental and psychosocial health among current and former professional footballers. Occup Med (Lond). 2015;65(3):190-6. Gouttebarge V, Jonkers R, Moen M, Verhagen E, Wylleman P, Kerkhoffs G. The prevalence and risk indicators of symptoms of common mental disorders among current and former Dutch elite athletes. J Sports Sci. 2017;35(21):2148-56. Hammond T, Gialloreto C, Kubas H, Hap Davis H. The prevalence of failure-based depression among elite athletes. Clin J Sport Med. 2013;23(4):273-7. Gulliver A, Griffiths KM, Mackinnon A, Batterham PJ, Stanimirovic R. The mental health of Australian elite athletes. J Sci Med Sport. 2015;18(3):255-61. Nixdorf I, Hautzinger M. Prevalence of Depressive Symptoms and Correlating Variables Among German Elite Athletes. Journal of Clinical Sport Psychology. 2013. Gulliver A, Griffiths KM, Christensen H. Barriers and facilitators to mental health help-seeking for young elite athletes: a qualitative study. BMC Psychiatry. 2012;12:157. Position statements published by the FSEM (UK) are quick reference or information documents for the Sport and Exercise Medicine and healthcare community. They can include up to ten short points of clinical relevance and are designed to be useful reference documents.